Planet Mars, symbolizing action and energy at the same time, is a fiery planet in Astrology. For more than a month, it exaggerates the emotions of the intuitive #Pisceans. Its turbulent nature leads to mood swings of the natives as they find various ways to channelize their energy. Just after the celebrations of the New Year Eve, Mars has dragged out of the watery Pisces and had entered into the burning Mars! Its been a little long since Aries is controlled by its ruling planet, where it has its most dominant impact. Mars, the winning planet makes you feel satisfied and confident and ensures you succeed at whatever you do. It rules your passion, drives you to achieve new heights, and act upon your goals and dreams. Free daily tarot reading to start your day in a positive way! 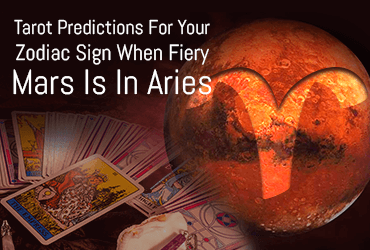 When Mars enters Aries, you become active, creative, high in spirit, awakened and livelier. You are motivated to channelize this excessive energy in all ways possible being art, dance, gymming, sports or any other physical activity. If this energy does not get a constructive channel, it will split out in anger and rage. Mars has entered in its home sign after a really long time! You are high in energy, have the drive to achieve your desires with an enthusiastic attitude. Mars is posing a strong impact on you as it is the one ruling Aries. You are energized to come up with something new and exciting. Read your Aries daily career horoscope. Mars is in its full aura to make you feel tense. You might experience mood swings and might not be your cheery self. It could be a troublesome time for you #Taureans. You would be blown away with anxiety, isolation, and stress. Don’t be too worried. Let it go. Things will get normal soon. Read your Taurus daily career horoscope. The entrance of Mars in Aries is a sign of high social visibility for you Geminis. You are up on making new friends and meeting the old ones too. High in energy, marking a social presence, hitting the social media with your updates, that is all you would be doing this season. Read your Gemini daily career horoscope. Hating the spirit and energy of Mars, you want to relax and chill! Better luck next time #Cancerians! As this fiery planet is going to spark the inner jazz within you. Coming with a positive note for your career, Mars is helping you to come up with something great at your work. Read your Cancer daily career horoscope. Mars is taking you to travel some new roads lucky Leos! It's the time to pack your bags and go on a vacation… Only if work permits you! The energy brought by Mars is asking you to take a break, go ahead and have fun. Read your Leo daily career horoscope. No doubt, Mars has activated your love line heading you towards spending quality time with your soulmate. At the same time, Mars is famous for its accidental nature. The energy boosted by Mars might also result in heavy taxes and bills. Clock your finances dear Virgos…! Read your Virgo daily career horoscope. With the positive aura of Mars, it is moving ahead to strengthen your love bonds. Both you and your love mate are high on energy making no time for anything else than Love. Warning: Don’t let your energy turn out to be destructive and give room to anger. Read your Libra daily career horoscope. Mars is loading you up with work, responsibilities and endless duties. Need not to worry #Scorpions as it is also packing you up with a lot of stamina and energy to finish your to-do-list in time. Don’t let the stress go to your head, balance it with fully loaded exercises! Read your Scorpio daily career horoscope. Congrats! Mars is coming up with an exciting event for you Sagittarius. You are high on brimming with some unique and alluring ideas. Your physical energy is high and you would take out some time for sports and outdoor activities. Read your Sagittarius daily career horoscope. Mars has activated your home life filling you with a ton of activities for the coming few weeks. Save yourself from breaking out! Little arguments may take place but don't let those domestic tiffs affect your love life. Your horoscope prediction is highlighting a change. Bec ready Capricorns! Read your Capricorn daily career horoscope. Learning phase goes on and on! Mars has promised to make you learn several new things, pushing you to mental alertness and winsome communication. Wait! It is also suggesting you to mind your words and think before you utter anything. Avoid having any heated discussions. Read your Aquarius daily career horoscope. Time to watch your finances Pisceans! It's the time to put all your energy into grabbing that opportunity ahead. Mars is amplifying your productivity levels. It's your turn to get the best out of the waste and improve your financial standing. Read your Pisces daily career horoscope. It is surely going to be an exciting season for all Zodiac Signs!